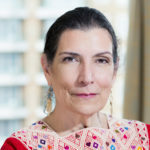 Alma Guillermoprieto is a Mexican journalist who has written extensively about Latin America for the British and American press. Her writings have also been widely disseminated within the Spanish-speaking world. "There is no point to samba if it doesn’t make you smile." "I love food and I love everything involved with food. I love the fun of it. I love restaurants. I love cooking, although I don’t cook very much. I love kitchens."